A business rule defines guideline with necessary constraint(s) needed for executing certain business operations. 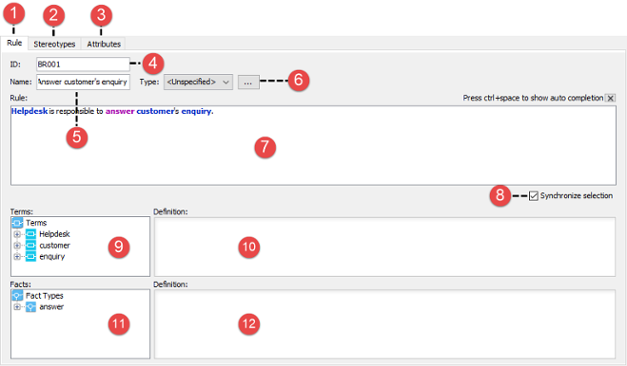 You can record and describe business rules with rule editor as well as to identify the term (vocabulary) involved in the rule, which helps tracing fact concepts around rules. This shows the Business Rule Grid. 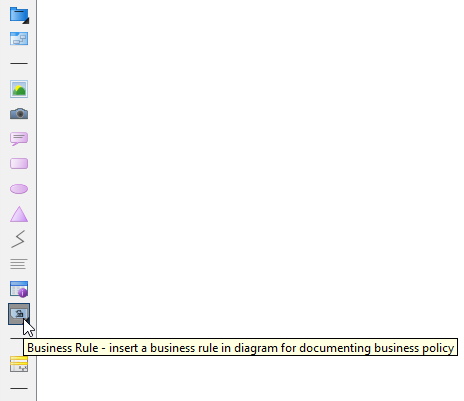 Click on New Business Rule to create a rule and enter a short and descriptive phrase as its name. Double click on the rule to edit it further. Fill in the rule content in the Rule field. 2 Stereotypes A list of stereotypes applied to the rule. You can extend a rule from a stereotype to add domain specific meaning to it. For example, you can extend a rule from stereotype critical to represent an important rule. 3 Attributes Read, add and remove attributes from the rule. Attributes can be added to denote extra properties to a rule. 4 ID A value that makes each rule unique. When you create a rule, an ID will be assigned automatically. The assigned ID indicates the order of rule creation. 5 Name A short phrase that describes the rule. 6 Type The type of business rule. You may click … the customize the available rule types in this project. Business rules created in this project can be in any of the defined type. 7 Rule definition A longer and more detailed description of rule. 8 Synchronize selection When the checkbox is checked, the Terms and Facts‘ active node selection will follow the selection as pointed by the mouse pointer in the Rule definition field. 9 Terms A list of terms that involve in the rule definition. 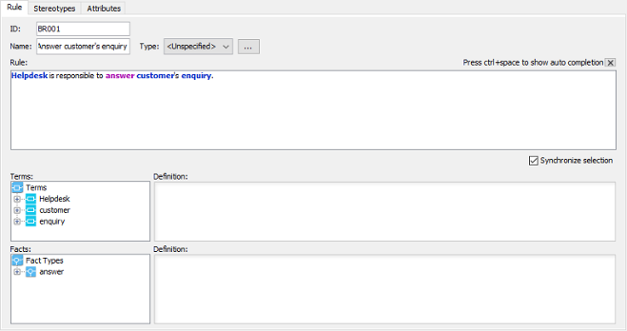 10 Term definition By selecting a term in Terms list, its definition will appear in the Definition field. 11 Facts A list of facts that involve in the rule definition. 12 Term definition By selecting a term in Facts list, its definition will appear in the Definition field. Select Business Rule from the toolbar. Click on the diagram to create a business rule. Name the rule with a short and descriptive phrase and press Enter to confirm. If you need to describe the rule in detail, right click on the rule shape and select Open Rule Editor from the popup menu. After that, fill in the rule definition in rule editor as mentioned above. A business rule shape has two visual states – collapsed and expanded. While in collapsed state, the business rule hides away the definition of rule, in expanded state, a new compartment will appear in the middle rule shape for showing the rule definition. To expand or collapse a rule shape, click on the top-left corner of rule shape. If you find a number of rules are of the same category, you can group them. 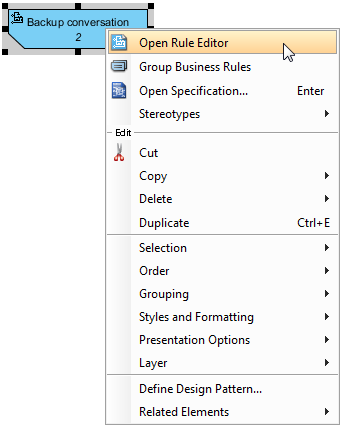 Right click on the selection and select Group Business Rules from the popup menu.